WREX was established in Belltown, Seattle by Michael Clay, Wes Bradley, and Aaron McKiernan in the early Fall of 1979. The venue, at 2018 First Avenue, was formerly a leather gay bar called Johnny’s Handlebar, located on the ground floor of a former brothel. Johnny’s Handlebar, at the time it closed was said to be the oldest, continuously open gay bar on the West Coast. For the first few months of it’s life WREX remained a typical 70s/80s gay bar, catering to local gay men. The unique décor inside WREX included old car seats in the back, old airplane seats in the side area, and Seattle’s first music video system curated by Ted Ladd. A DJ spun the popular music found in thousands of gay discos around the nation (and in Seattle) which also included a handful of the poppier “new wave” hits that most gay bars also included among their playlists. As the novelty of the new gay bar wore off the gay clientele retreated to many of their previous haunts around town. The Brass Door, Neighbors, The Park Avenue, and a plethora of other LGBT venues that were popping up with regularity. WREX was still viable as a business, but they needed something more to bring in customers. One of the targets WREX had not yet tapped into was the growing popularity of punk in the LGBT community Many who came of age during the punk era rejected the “clone” culture that pervaded the gay scene at the time. Not only that, alot of younger straight adults interested in punk barely regarded a difference between themselves and their queer friends. They all gravitated toward punk as an alternative, so they were all one tribe. It’s not surprising that gays bars were regularly part of the punk scene of the late 70’s and early 80’s. They were always ready to allow punk rock in their midst because it represented the same kind of outsidership, and it’s no wonder so many gay youth were willing to embrace more outré artists that had emerged from gay disco-artists like Sylvester and the iconic Grace Jones. Seattle’s punk and gay communities have often mingled together, and the subcultural mise-en-scène at WREX was no exception to that general rule. Occasionally, former Johnny’s Handlebar clientele would drop in after WREX’s opening, not yet knowing about the change in management and regular crowd. Since both gays and punks were then equally shunned by mainstream Seattleites, there was no true clash between the two subcultures. Armed with that knowledge two gay young men who were familiar with the cross-pollination between punk and gay culture approached Aaron McKiernan, the principle investor in WREX with a proposal. One night a week WREX would host dances showcasing the latest independent, alternative and punk rock. The two DJs there were Charles “Upchuck” Gerra, then a prominent figure within Seattle’s punk scene, and Dennis R. White who would later become a graphic designer. promoter. manager and part of the staff of The Rocket. Although Gerra spun a few records each night, his real strength was hosting, mingling with and entertaining the crowd and promoting the fact that WREX had now become a haven for young gay and lesbians searching for their own space. And with them came their allies and friends in the punk community. All-ages clubs and all-ages shows had come and gone in Seattle, but no single club had devoted itself to punk and alternative dance music. There was a ready audience waiting, so, on a rainy night in December 1979 just after 8PM the needle dropped onto “Orphans” by Teenage Jesus and The Jerks. A new chapter in Seattle music had begun. At first the crowds were sparse, but they grew throughout 1980 and eventually the club was just as much a “gay” venue as a “punk” venue that welcomed anyone with a love for the alternative scene. Some time during this period, Mike Vraney (of Time Travellers and Modern Productions) began to book live music at the club. His sights were high and he intended to showcase the best of popular local alternative bands with rising stars on the indie scene both in the US and Europe. The first live band to play WREX was The Fastbacks (with a young Duff McKagen on drums). Their set was meant to work out any kinks in presenting live music, and in anticipation of the first official show at WREX. The next night The Blackouts and The Beakers opened for Delta 5 from Leeds, England. Delta 5’s politically infused feminist politics had made them stand-outs in the early post-punk years. From then on bands played at WREX three nights a week, originally booked by Vraney. During his very successful run of bookings Vraney brought national and international acts to the club, as well as booking the cream of the crop of Seattle alternative bands. The job was eventually turned over to WREX manager/publicist Wes Bradley. Bradley had extensive ties within the established music business, so it wasn’t hard for him to get his foot in the door of the labels promoting alternative acts that were finally seeing some success in the wider music business. Bookings were also handed over to independent agents as well as bookings by members of WREX’s own staff. At the same time Ted Ladd, a video artist and curator was in the process of making headway with both video wallpaper and showing music videos between DJ’s and live music sets. The shows filled it’s tiny space for most of the time WREX existed. Along with almost every local band then playing original music (starting with the Enemy), touring acts who played at WREX included Grace Jones, Joan Jett, X, The Fleshtones, Romeo Void, Wall of Voodoo, Los Microwaves, Hüsker Dü and others who were then becoming staples of alternative and college radio. The frequency of shows — and their apparent local popularity — inspired other bars around Seattle to start booking original-music bands, thus giving a crucial boost to Seattle’s punk scene at a crucial time in its development. Additionally, certain bars near WREX in Belltown — such as the Frontier Room and the Rendezvous — soon became local punk hangouts. 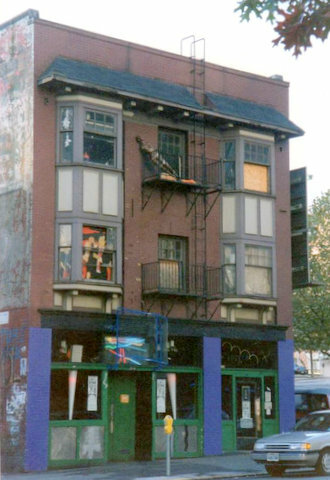 One gay bar that had always been punk-friendly was Tugs, Belltown. The proximity of Tugs and WREX exponentially help create what would be one of the city’s best strips to enjoy music on, First Avenue. A little further south down road lay The Showbox, and during the heyday of it’s operation was a showcase for everyone from Captain Beefheart to John Cale to The Specials to James Brown. Smaller all-ages venues like Danceland and one-off store front gigs and artists’ studios became common. 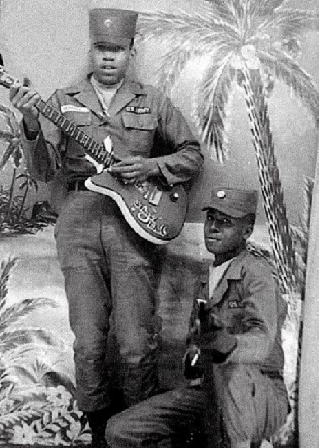 By the height of WREX’s popularity Upchuck had continued pursuing his career as a rock performer, Dennis White was spinning records one night a week, and involved in The Rocket, his own musical side projects, churning out hundreds of rock posters and producing a few band’s recordings on his Pravda label. But the bulk of the music was presented by DJ’s Michael Clay and Ross Bostwick. Bostwick would become the one single DJ that was the powerhouse behind the dance music at WREX. He also made the transition to the most popular DJ when the space became The Vogue, a few years later. His excellent taste in what was new, progressive, alternative or downright spooky kept the audience intrigued. Meanwhile Ted Ladd continued to curate punk and new wave videos-a job he continued after the club became The Vogue. Some people see The Vogue as one of the first venues to host bands that would one day be known as “grunge”…but like the transition from the 80s to 90s Seattle music scene, it’s hard to escape that WREX had been important to that which would emerge around The Vogue and other clubs like Gorilla Gardens, The OK Hotel and The Metropolis. Anyone old enough or with a good fake ID who would go onto become part of the late 80s/early 90s movement had stepped inside the doors of WREX at least once. “We all stand on the shoulders of giants” as has been pointed out so many times.